What on earth is a lusciously fruit-filled recipe like this doing on my kitchen table in February? Because I’m desperately craving some sunshine, pastels, and floral sweaters as I watch the snow fall out my window. While I know the east coast hasn’t been hit nearly as hard as the midwest, we’ve had more snow than we know what to do with. My parents didn’t have electric for days, our home flooded, cars got stuck, and there were a handful of days with a -10 windchill. Brrr. I love the snow, but someone pass me a fork. I’m diving headfirst into this sunshine-sweet, springtime layer cake and not coming out until it’s April. I made this cake for my girlfriends, Megan and Erin. The three of us got together on Friday night and had a little dinner party at Megan’s house. We drank wine, ate chicken piccata, toasted almond goat cheese salad, and fresh blackberry cheesecake for dessert. Made by Megan, who is a photographer, cupcake enthusiast, and accountant. Megan taught me a lot about photography. On top of all of that, I brought over a few slices of this cake and a fresh batch of oatmeal cookies. It was our own little Thanksgiving. And yes, I’m still full! Megan’s husband said the cake reminded him of a super moist sponge cake. Megan and Erin said the lemon flavor was spot on, as well as the cream cheese frosting’s sweetness. Not too sweet, not too tangy. The perfect accompaniment to the lip-smackin’ cake underneath. 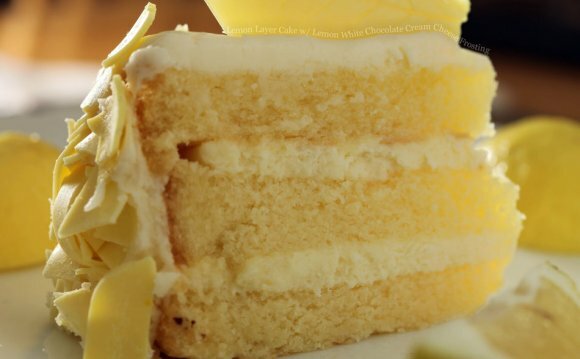 Making a tall layer cake shouldn’t be overwhelming. Rather, it’s very simple if you take your time. Read the recipe and know ahead of time everything you’ll need and at which point you’ll need it. I’ve got a few pointers about this luscious cake. And I guarantee you will impress anyone who takes a bite! Make sure you use fresh lemons. None of that lemon extract stuff! And no bottled lemon juice, which is quite potent. * How to choose lemons at the store? Make sure the lemons you choose are smooth-skinned and heavy for their size. That way you know they are extra juicy. Fresh or frozen blueberries are OK. If using frozen, do not thaw. And don’t worry – the blueberries will not sink to the bottom of your cakes.